Hi! I’ m at my second update in absolute. 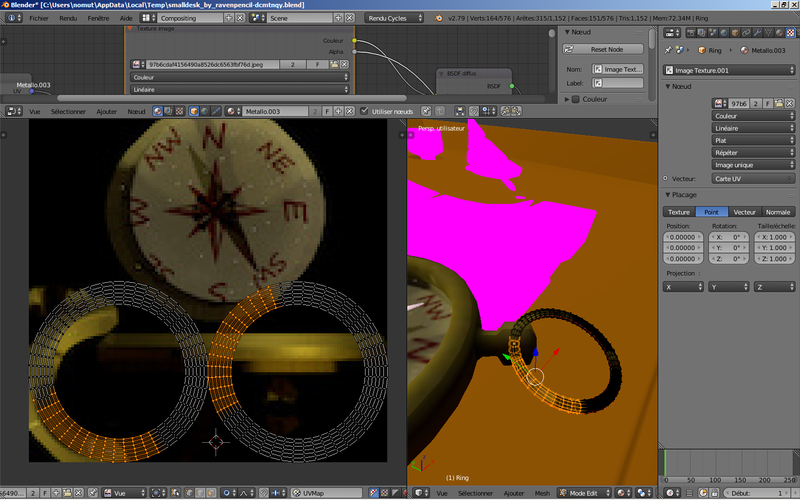 There are two meshes (the compass and the ring attached to it) that should be on their own and instead they are viewd as one, with the consequence that when the texture is applied it’s a mess. I thought there were a problem with my exporting program (Blender3D), but I tried re-importing the averall and it works. Hmm. Have you tried uploading the .blend file directly instead of exporting OBJ? Nope, from what I understood reading Sketchfab guide for uploads, obj format is read correctly and others formats are a so so. Maybe it was a bad interpretation from my part. Could you share the original Blend file with us so that we can check and get more info of what’s going on ? I downloaded your file and the texture associated with the compass . Here is the result obtained in blender . I suppose , you may be able to solve your problem by changing the place of the mesh or choosing another name for the texture of the ring. The issue is not about textures (I believe), since I manually added them after with Sketchfab in-functions.